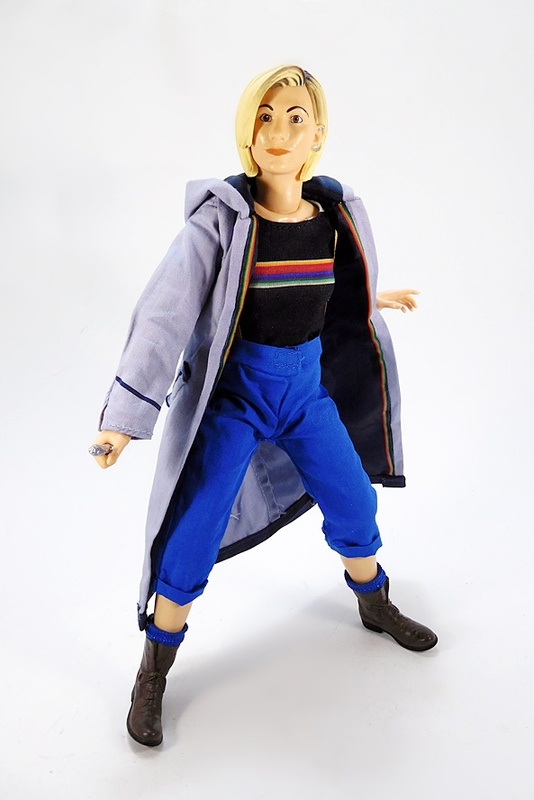 To know me is to know I adore Doctor Who, and I miss the days when Character Options was pumping out an extensive line of action figures from both Classic and NuWho. It’s so bizarre that they still hold the license and yet only toss out a figure or two a year these days. My guess is that they over-extended themselves when they were pumping out figures of almost every character to appear in each current series. There’s got to be a landfill of Grandma Connollys somewhere in England. 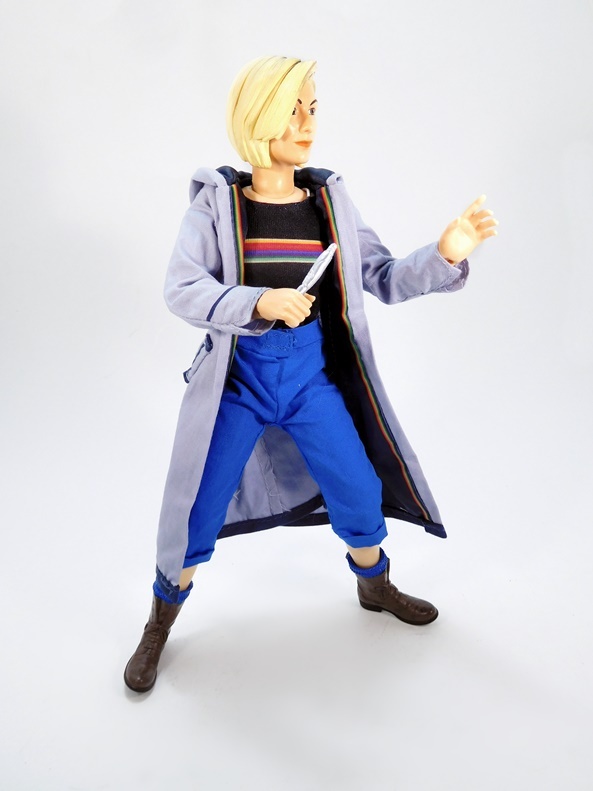 In any event, I have no doubt they’ll get around to producing the Thirteenth Doctor for their 5-inch line, but in the meantime, they managed to get this “Adventure Doll” out before the premier of the new Series with The Doctor’s latest incarnation. And here she is in her very non-collector friendly packaging. Thirteen comes in a large plastic bubble with a cardboard backing. The insert includes a TARDIS motif on one side as well as a shot of the TARDIS and the new series logo on the bottom. It’s an attractive presentation, very bright and colorful, but as I said, not intended for collectors. I’d almost feel bad about opening it, but mine got crunched a little on the top corner during its’ trip from Merry Old England, so I won’t feel too bad about razoring it open. 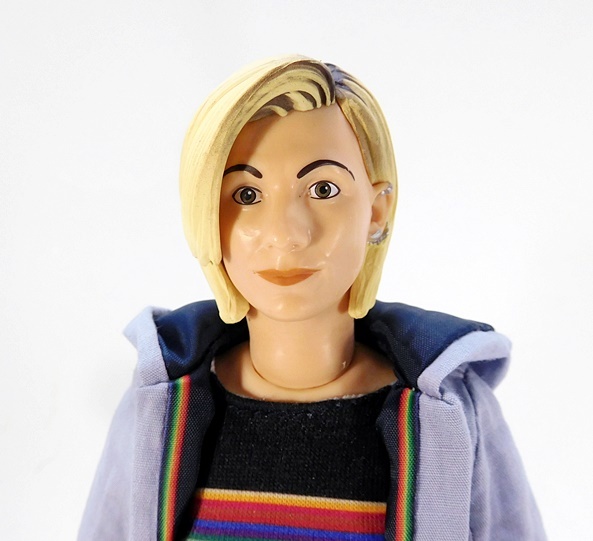 Here’s The Doctor freed from her package and I have to say for what this is I’m quite pleased with it. 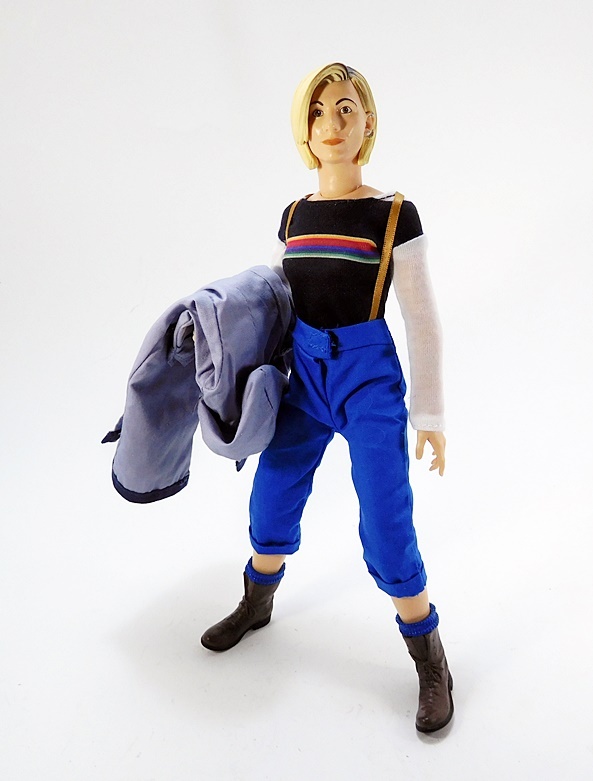 The term “Adventure Doll” really characterizes the feel of this figure, as it’s definitely not aimed at collectors, but I could see children running around and clutching this figure by the arm and going on all sorts of adventures. She measures in at about 10-inches, which is something of an oddball scale. 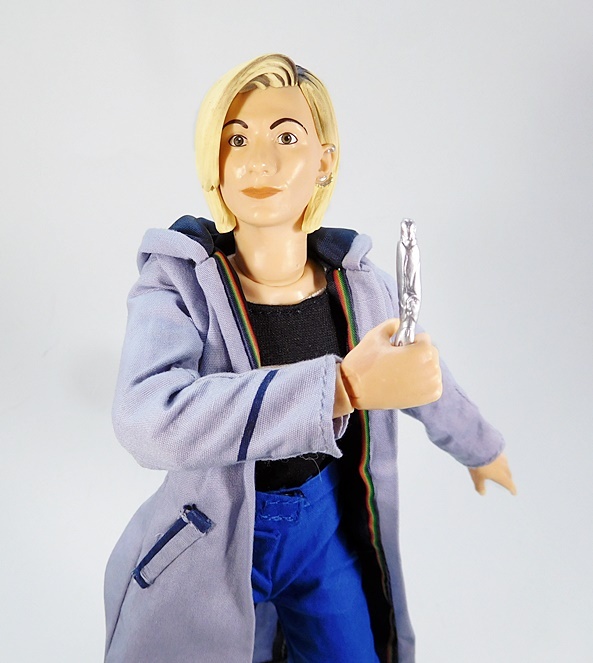 Character Options released a number of similar clothed figures for NuWho in the past, but they were proper Sixth-Scale, so Thirteen isn’t really going to fit in with many of those figures, although as we’ll see in a bit, she sort of works with some of the aliens. 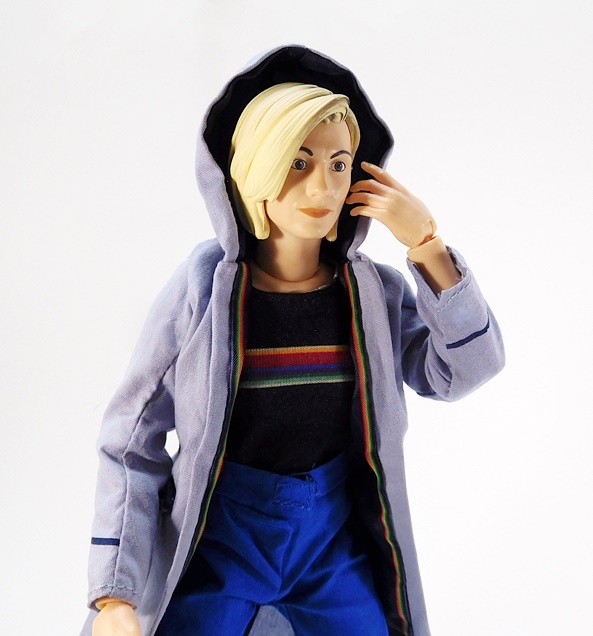 The outfit is done entirely in soft goods and includes a pair of bright blue pants, which are cuffed just below her knees, a black T-shirt with a rainbow pattern across the chest, and a long gray coat with a hood and rainbow stripes running up the front flaps. Her boots are plastic with sculpted blue socks showing. The tailoring on the outfit is pretty solid and the ensemble fits the figure quite well. 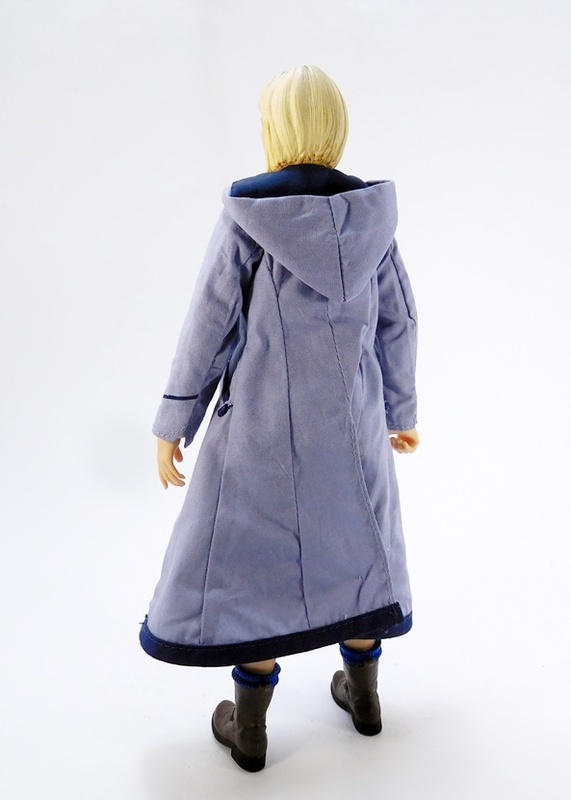 There are some concessions, like the pockets on the coat are just stitched on and not functional, however, the hood on the jacket can be worn up. Removing the jacket reveals white sleeves on her T-shirt and a pair of thin gold suspenders. 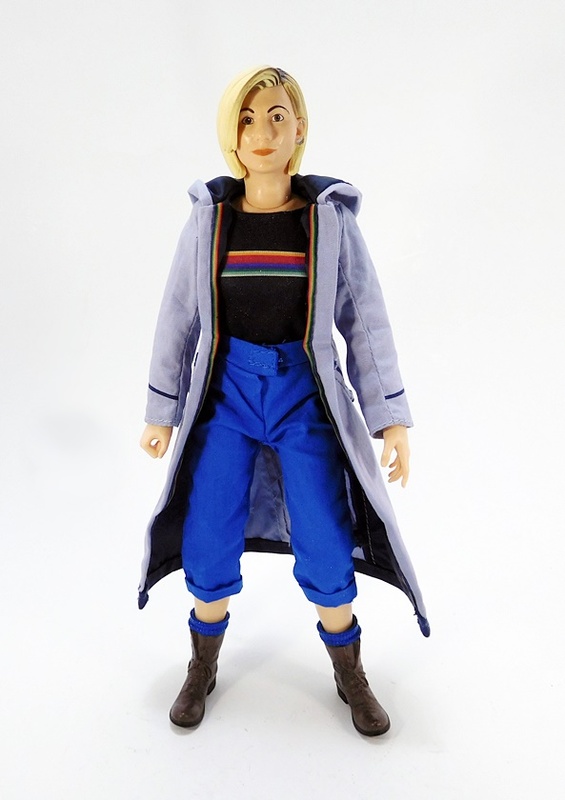 Overall, I like the design here and it feels a lot more like a trademark look, which is something I missed during The Eleventh Doctor’s tenure. It hints at some of The Doctor’s more colorful wardrobes without going full on crazy Technocolor Dreamcoat like The Sixth Doctor did. Still, I can’t help but feel this design was inspired a little too much from Mork from Orc and I just can’t unsee it. The portrait isn’t bad for a figure in this price range. I can certainly see a likeness to Whitaker in there. The paint is very basic, but it’s clean, particularly on the eyes and lips. They even included her interesting earring, which is the first I’m noticing it. Her hair is sculpted to cover part of her face, which looks good. If I had one complaint it would be the heavy handed paint on her roots. It’s not terrible, but it’s not great either. The articulation here is surprisingly good. I will say that the integrity of the joints vary. The leg joints can be a bit loose and sometimes makes it hard to get her to stand, although I didn’t have to use a stand for any of the poses I shot, so it can be done. The arms feel OK, but the neck is curiously tight. When I first tried to turn her head, I was afraid I was going to snap it off. Even now, it still requires a fair amount of effort to get her head to turn. 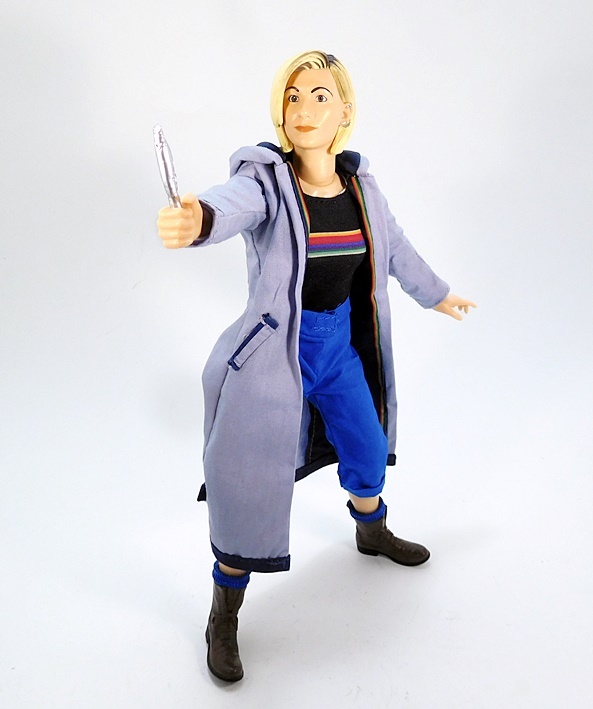 In addition to her outfit, The Doctor comes with one accessory and that’s her new Sonic Screwdriver. It’s a very simple piece with a nice coat of silver paint. I’ll toss in here that I’m not at all a fan of this design. It does look more alien, but it’s looking less and less like an actual screwdriver with each new design. 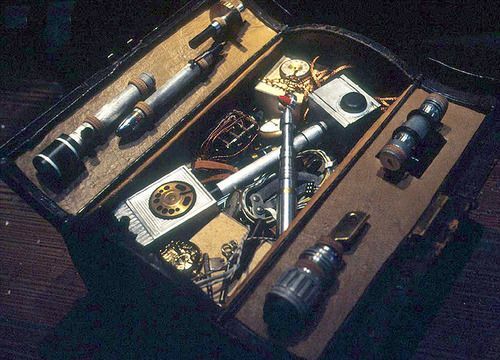 I always liked the idea that The Doctor just pulled his favorite accessory out of the TARDIS Toolkit one day and modified it to make it more useful. But throughout the course of NuWho it’s becoming more and more like a Magic-Wand-Slash-Tricorder and that’s never sat well with me. 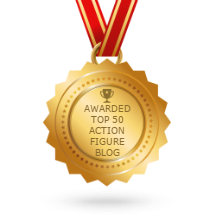 But that’s an old rant of mine, and not something to detract from this figure. Finally, here’s a quick comparison of The Doctor with some of the aliens from CO’s 12-inch line, and I think in this case these figures work OK. 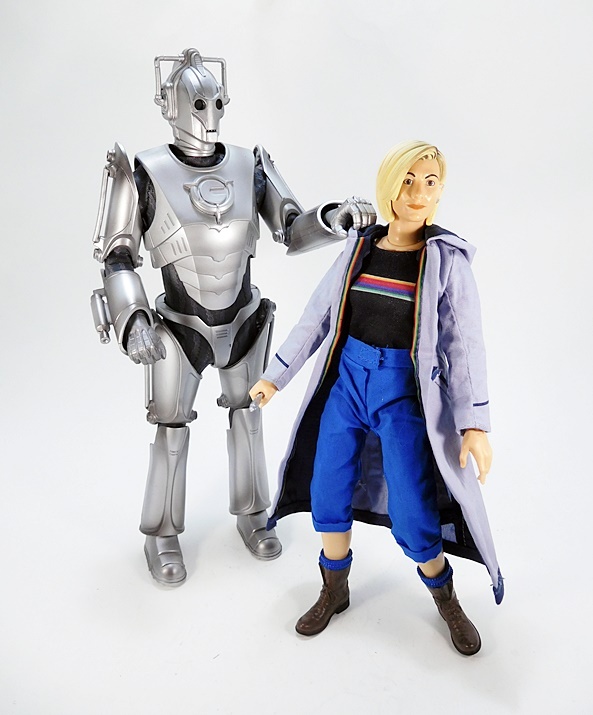 I know the Cybus Cyberman aren’t really THAT tall, but I still wouldn’t have any trouble displaying Thirteen with either of these figures. 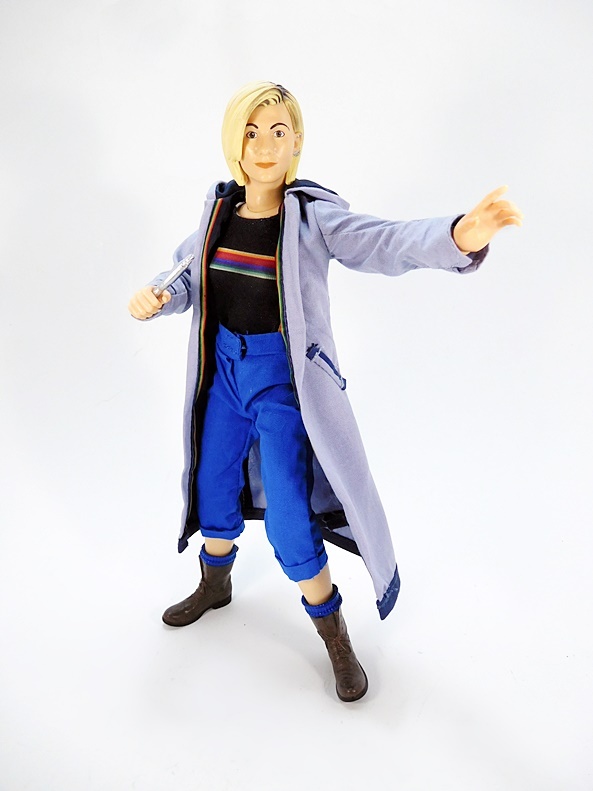 I found this figure on Amazon from a UK Seller for around $35 and jumped on it, despite the fact that I’m usually put off from ordering Internationally. Nevertheless, I’m glad I did, because it quickly went out of stock and I haven’t seen it offered anywhere else. 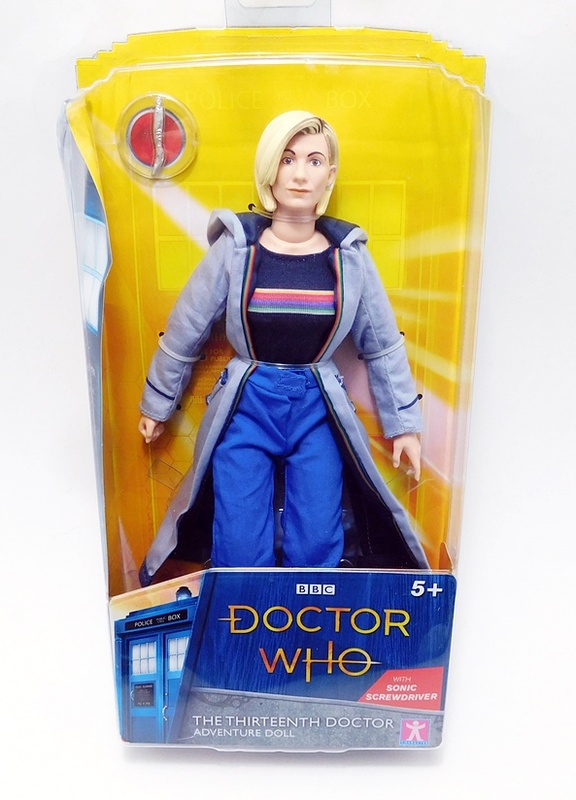 Granted I paid something of a premium, as I would imagine this figure to sell somewhere around $25 if I found it on the shelf at a US Retailer, but as popular as Doctor Who has become here, I still don’t think the distribution on this one will be too extensive. Either way, I think she’s a fun figure and the moniker Adventure Doll fits her perfectly. 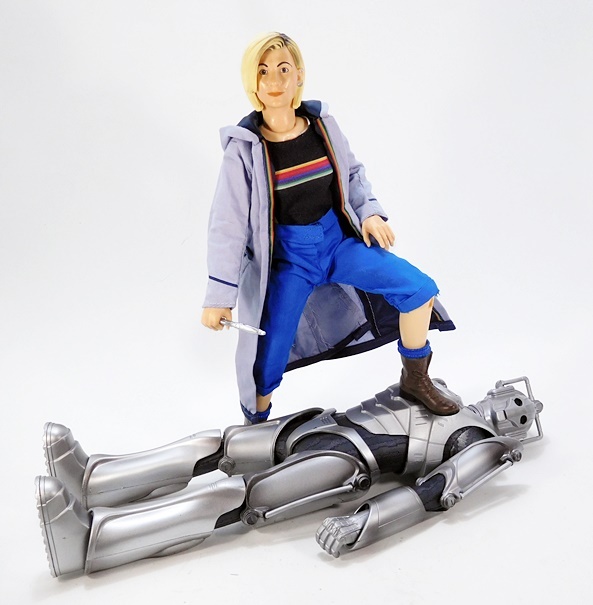 Sure, I wish CO had produced her in a proper Sixth-Scale, but maybe they’ll release some other figures in this line to go with her. Eh… probably not.